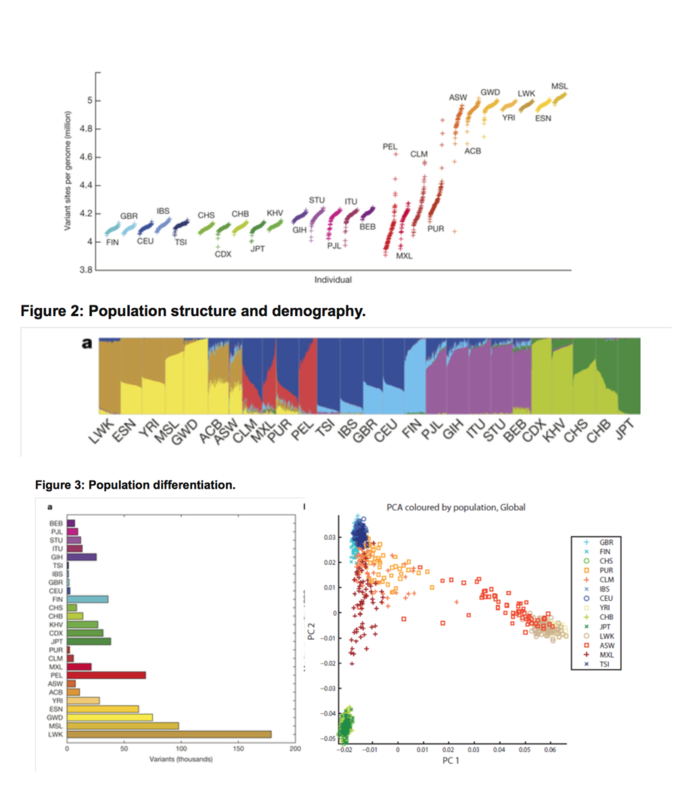 The thousand genome project was an early large-scale population genomics project which sequenced 2,504 individuals from a broad range of regions and ancestries, with aligned reads and called variants being made publically available. The resulting populations included some now-classic figures in population genetics, such as those shown to the right. Here we describe our process of reproducing this analysis of important, public, moderately sized data sets with well-understood characteristics, but now across a partitioned, federated set of the data. Our aim is to demonstrate that we can perform a wide range of federated analysis over vertically-partitioned data sets located across Canada. To federate the data, we randomly partitioned the individuals in the thousand genome VCFs into three equal sets, and partitioned the VCFs themselves correspondingly. We then removed any variants from each of the partitions that were note observed within that partition, as they would have no reason to be listed absent any observations in the local data; this ensure swe have to do realistic bookkeeping to merge the data sets. We then stood up GA4GH read and variant servers across Canada (Ontario, Québec, and British Columbia) atop these data sets. When performing the analyses over the GA4GH API (using the nice Python API) we found that querying the calls data has been prohibitively slow. In particular, querying variants with a large callset takes a long time. Testing revealed that for 900 calls, it would took ~10s to retrieve 50 variants. To find the cause, a profiler was inserted into the GA4GH Flask server. The majority of time was spent in the convertVariant function. This function converts the variants from pysam objects to google protocol buffer (protobuf) messages. This process creates millions of small objects that takes a long time to process when querying a large callset. Querying variants can be sped up by a factor of 4 by making modest changes to the GA4GH client and server — by using the C++ version of protobuf, and by using protobuf serialization rather than serializating into JSON, and these changes have been contributed back to the project. However, more substantial performance wins can be made by reconsidering how per-call (or even per-variant) data is stored and accessed within the schema. Another performance gain of 12x was achieved by implementing a separate API call to directly return a genotype matrix (which can be viewed here ).